Managing big, complex projects can be daunting. With external and internal factors to consider, deadlines to meet and budgets to adhere to before you reach your end goal, it’s no wonder we get overwhelmed. 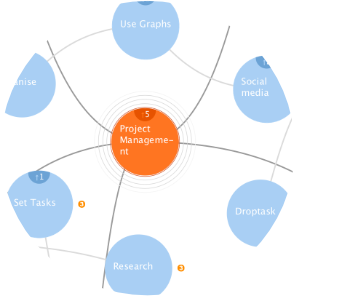 iMindMap has a workspace to suit every stage of the project management process, from the initial brainstorming to executing. Each workspace offers a unique way to visualise the information surrounding your project. They will help to ensure you consider all factors, plan thoroughly, prioritise effectively and ultimately streamline your project management. Read on to find out how to make unclear, poorly communicated and time consuming project management a thing of the past. Sometimes knowing where to begin can be the most difficult part. Start by putting in the groundwork. Draw out and consider all of the information surrounding your project to set yourself up in the best possible position for successful project management. Consider the external factors that might impact your project, such as economic change and new legal policies, and internal factors, such as company resources and budget. Brainstorm who will be involved in the project, its goals, objectives, scope, time-schedule and cost – these are the anchors that will keep your planning on track and set it up for success. Brainstorming these topics thoroughly will ensure you have an in-depth understanding of the project and highlight any risks early on. iMindMap 9 Ultimate’s Fast Capture View is great for quickly capturing any ideas you have to get your project off the ground. Get your ideas down without distraction using self-organising bubbles. Forget formatting and structuring at this stage and concentrate on exploring every avenue of your project. The free-form nature of the Fast Capture View fosters a creative mind-set, so your brain is free to make associations and give birth to new creative ideas. You should have a large amount of ideas and information at hand from your initial brainstorm. This is great for thorough planning, but what are you supposed to do with it all now? In just a few clicks, seamlessly take your ideas from the Fast Capture View to iMindMap Ultimate’s Brainstorm View and watch your ideas convert into sticky notes. The Brainstorm View is an unrivalled platform for sorting, categorising and compiling information. Highlight key information by colour coding sticky notes and use mini-boards to group related topics together. Finally, bring order to your thoughts with one click using the Clean Up button. With all of the information condensed into a clear and concise brainstorm, you have a great starting point to develop and refine your ideas into a project plan. 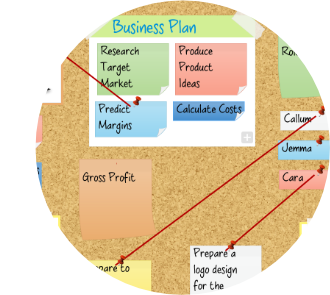 Mind Mapping is an excellent way to break into project planning. This visual, creative technique supports the cognitive process of the human brain, making it easier to conceptualise the large volumes of complex information that you face when planning a project. As you keep adding and developing your ideas, a Mind Map will give you a bird’s eye view of your project, allowing you to keep a clear perspective at all times. A meticulous plan is essential to the success of your project, so it’s important to cover all bases. Mapping out your thoughts using radiating, curved branches and keywords triggers associations in your brain to spark further creative ideas, so you can develop and elaborate on the themes of your project. You can be safe in the knowledge that your plan is thorough and no stone has been left unturned. To create a clear plan for your project, effortlessly switch from iMindMap’s Brainstorm View to the Mind Map View and watch your sticky notes transform into a pre-structured Mind Map. 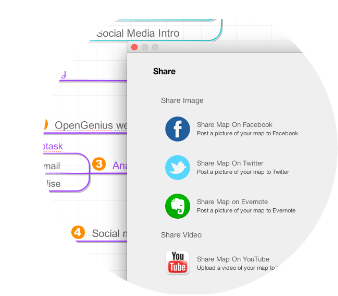 Attach notes files, comments, audio, links and more to your Mind Map to capture lots of detailed information on one, infinite canvas. These additions remain hidden until clicked on so that your map remains uncluttered. 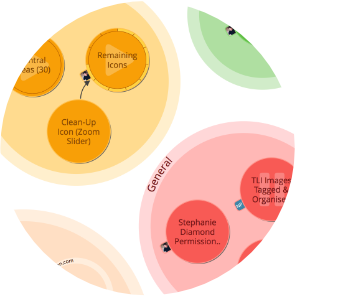 The Mind Map View provides a clear overview of your project so it’s easy to visualise the most important tasks and spot weaker areas that need further development. What’s more, locating, organising and editing your ideas is a breeze using the Outline Panel. No matter how large or complex your project is, the Outline Panel’s vibrant list format is a visual guide that enables you to make the appropriate changes without having a negative effect on the entire project. Now you can put your plan into action! During any project plan, communication is key. Due to the unpredictable nature of project planning, communication can easily waver off path and interpretation errors can lead to the project being delayed or swayed off-track. iMindMap is integrated with popular desktop tools such as Google Drive, Dropbox and Evernote so you can share your Mind Map with your team. This helps you to ensure that your team are all on the same page, even if they don’t have an iMindMap license. Need to pitch your project to your team? Create a slick presentation using iMindMap’s Presentation View. Alternatively, jump straight in and start actioning your ideas using iMindMap’s integration with visual task management app DropTask. From here, you can visualise even the most complex project on a colourful and unique visual interface. Organise your workload using a drag and drop approach to categorise tasks into colorful group circles. Allocate tasks to your colleagues, prioritise tasks, set due dates and request status updates. 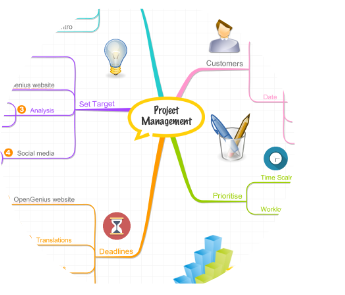 iMindMap offers an enjoyable and creative way to manage your projects from ideation to execution. You can rest assured that your project is on track with iMindMap’s four unique workspaces and integrations to aid you at every stage of your project’s development. See for yourself how iMindMap can help you to capture, sort, develop and launch your ideas into successful projects.